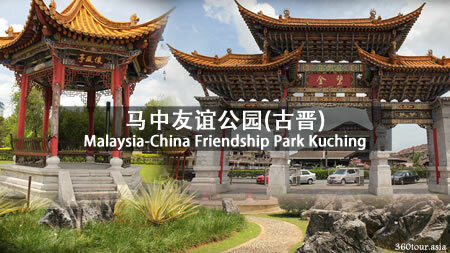 Address: The Spring Shopping Mall, Jalan Simpang Tiga, Kuching, 93300 Sarawak, Malaysia. The Spring Shopping Mall is one of the first large-scale lifestyle shopping mall located at the main road of Jalan Simpang Tiga, Kuching. It is open to the public on 10th January 2008 and stay as the Kuching’s largest shopping mall until 2013 when Bolevard Mall was completed. This Mall was awarded the Best Shopping Mall 2012/2013 for Sabah and Sarawak by Tourism Malaysia. 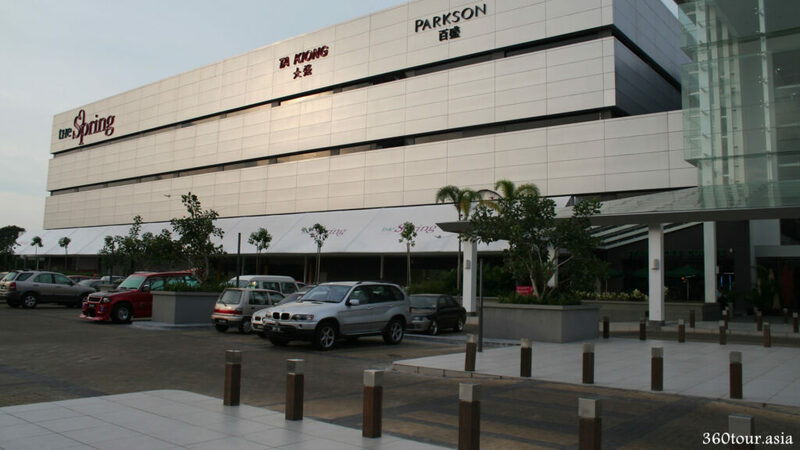 In this two storey building, you will find Parkson, Ta Khiong gourmet supermarket, MPH, HSL, Factory Outlet, Padini, Bonia, Bata, Hush Puppies, K2Factor, Mango, Esprit, Guess, Coach and other established brands. This building also hosting MBO Cinemas, Food Bazaar and a small children theme park. With mission “Delivering FRESH shopping experiences through retail innovations”, this RM150 million project was designed by a New Zealand-based architectural firm, Warren & Mahoney. The Glass Atrium at the main entrance of The Spring Shopping Mall, allowing natural lighting into the mall while insulating from the tropical heat. The main concept of this mall is “Spring” , which also signify “FRESH” and an new beginning, a new seasons. There is a massive glass atrium at the entrance,and careful alignment of sky windows along the retail shops. The Mall is passively bath with natural sunlight during the day, while still insulated from the hot tropical weather. Along the marble floor of the mall, it is decorated with many symbolic spring flower motif. This “Dayak Totem” PokéStop is a favorable stop for farming as it is within walking distance with other PokéStop within the Spring Shopping Mall. Pokemon Go Trainer can play Pokemon Go while Shopping at Parkson Department Store and dinning at Shushi King. “Dayak Totem” depicts a replica of sacred Totem usually hand carved from a single hard wood tree trunk. The motifs on the totem depicts interlocking Creepers. Totems can usually appears in many size and motifs. These totem is usually found in front of traditional long houses. Before the Dayaks converted to Christianity, it was believed that the men would strengthen their souls by carving totems, and make the brave in battles, as well as, to ask the deities for good harvests and for protection of the longhouse community from evil spirits. Dayak Totems are a usual festive decoration during Gawai Dayak in the Spring Mall. This totem photo is taken in year 2010. However these festive decoration are not permanent fixtures. The theme is based on the latest upcoming festive celebrations, such as Raya, Gawai, Chinese New year, Easter, Mid-Autumn festival, Deepavali, Halloween, Christmas etc. Dayak Totem PokeStop at The Spring Shopping Mall Kuching as shown in the map in Pokemon Go game. “Dayak Totem” PokéStop is located at the Parkson Departmental Store of the Spring Mall, which is around 15 meters from the actual location at the East Court of the Mall. Pokemon Go Trainers can access this PokéStop from most part of the Parkson Department Store, Shushi King Restaurant, East Court and Part of Osim store. This allows Trainers to play Pokemon Go while Shopping and dinning. Do aware your surrounding while wander and catch Pokemons. Coincident or not, Pokemon Go Trainer who want to find the Dayak Totem PokeStop might end up finding this promotional display of “Relax.Recharge.Rejuvenation” Recharge Go station at OSIM store. This PokéStop is one of the stop famous for farming as it is within walking distance with other PokéStop. Pokemon Go Trainers can walk along the East, Center, and West Court of the Spring Mall to access most of the PokéStop within the Mall. This “Dayak Shield” PokéStop is a favorable stop for farming as it is within walking distance with other PokéStop within the Spring Shopping Mall. It have possible overlap with “The Spring Water Feature” and “Dayak Totem” PokéStop. Pokemon Go Trainer can play Pokemon Go while Shopping at most of the nearby branded store outlets. Some may face GPS accuracy problems while in the Mall. “Dayak Shield” depicts a Dayak tribal warrior shield, located beside the Elevator at the West Court of The Spring Mall. In the earlier days of head hunting and warfare in Borneo, Success in war and taking heads was key to a young man’s status in the community. These shields were used to defend at close range against swords known as Mandau and at longer range the opponents spears and darts shot from blowpipes. These highly decorated Warrior shields usually made from Hard wood and depicts monster-like faces with long protruding teeth on the front surface of the shield. It depict a supernatural creature that will scare and weaken the opponent while protecting the owner. Other than using as a shields for war, currently most shield used for warrior dance performance. The Shield portray the courage of the warrior. Dayak shield is one of the element of festive decoration for Gawai Dayak celebration in The Spring Mall. This replica model is holding a replica Shield. It is on display in 2015. Dayak Shield PokeStop at The Spring Shopping Mall Kuching as shown in the map in Pokemon Go game. “Dayak Shield” PokéStop is located at the West Court of The Spring Shopping Mall, beside the escalator in front of the Parkson Departmental Store. This PokéStop is near to the Spring Water feature. Pokemon Go Trainers can access this PokéStop from part of the Parkson Department Store, Rolex Store, Guess Store, Victoria Secret Store, Chatime Beverage, Hush puppies Store and many other well known store outlet. Trainers can play Pokemon Go while Shopping in the nearest branded store outlet. Do aware your surrounding while wander and catch Pokemons. The Dayak Shield festive decoration supposed to be in front of this escalator in 2014, but currently there is non on display. This PokéStop have a close Overlap with the nearby “The Spring Water Feature” and “Dayak Totem” PokéStop. Hence this is one of the most favorable PokéStop for Lure activation and farming. Pokemon Go Trainers can take a short walk along the East, Center, and West Court of the Spring Mall to access most of the PokéStop within the Mall. At times Pokemon Go Trainers Lure activate all the PokéStop nearby and create massive spawns frenzy. The Spawn Frenzy at the Spring Mall after all the PokeStop within the Mall is Lure activated. Like it or hate it when 5 Ratatas simultaneously spawned. Random spawns from the spawn frenzy. The PokeStop can have overlaps with “The Spring Water Feature” PokeStop. With all the benefit that one might find, there is still inaccuracy of GPS signal for some devices due to interference from the building itself. Occasionally Pokemon Go Trainers may have difficulty access this PokéStop even at the correct spot. This “The Spring Water Feature” PokéStop is one of the recommended PokéStop for farming in this Mall as it is located at the center of the Mall, which have one possible overlap with “Dayak Shield” PokéStop. There is total of 5 PokéStop within this Mall. GPS accuracy might be an issue with some device within the Mall. Pokemon Go Trainers can enjoy catching pokemon while shopping. The Water Feature at The Spring Mall Kuching. It features multilevel moving color rings on a stainless steel pole. The Spring Water Feature is located at the mall center court, with height spanning three floors from the basement floor up to the second floor. It features three vertical stainless steel pillar piercing into 4 – 5 colorful “plate” each. Each “plate” is capable moving independently of each other, raise and descend randomly with aid of inner mechanical contraptions. There is multiple “strings” spanning across these plates, allow smooth flow of water down from top at the height of three storey, to the pool below without splashing. With the height spanning three floors, the water feature span across from the basement floor up to the second floor through a Square opening. This square opening not only allow the placement of the water feature, but also act as place for natural ventilation of the mall. With the pool of water at the base and constantly flowing water along the feature, it further enhance the humidification, ventilation and circulation within the mall. The Water Features as seen from the top floor. Other than for entertainment purpose, many people still make this water feature one of their “Wishing Well”. Occasionally coins are thrown down to the pool below or collected at the “Color Plates”. The management do prohibited people from throwing coins into the water feature, but you will still see many coins lying around in the Pool. The Spring Water Feature PokeStop at The Spring Shopping Mall Kuching as shown in the map in Pokemon Go game. The Spring Water Feature PokéStop is located near the west court of The Spring Shopping Mall. Pokemon Go Trainers might found the pokestop is few meters away from the actual attraction, which likely attributed to the poor GPS accuracy within the building. However it is one of the most accessible PokéStop within the mall. The spawn radius span across few major retail outlets between center court and west court. Pokemon Go Trainers can wander and catch while enjoy indoor air conditioned shopping in the mall. However do aware of your surrounding when wandering, as you may end up bump into another shopper or run into decorative festive ornaments. Be careful while walking or playing near the glass balcony along the walk way of the second floor. This stop is closely overlapped with “Dayak Shield” PokéStop, creating one of the spot for farming within the mall. With lure activation it may create a spawn frenzy. There is total of 5 PokéStop within short walking distance in this Mall. Usually Pokemon Go Trainers will choose to Lure activate all 5 PokéStop. The pokemon spawn frenzy within the mall. This area do spawn Abra, Paras, Eevee and most of the time bunch of Pigeys and Ratata. This “Golden Horse” PokéStop is a favorable stop for farming as it is within walking distance with other PokéStop within the Spring Shopping Mall. It have possible overlap with “The Spring Golden Coin” and “The Spring Water Feature” PokéStop. Pokemon Go Trainer can play Pokemon Go while Shopping at the nearby branded store outlets or have a relaxing dinning at the nearby Pizza Hut and KFC Restaurant. Some may face GPS accuracy problems while in the Mall. “Golden Horse” depicts a gold painted polystyrene life sized horse replica placed at the court section between Center and West Court of the Spring Shopping Mall. These replica is placed during the Chinese new year of year 2014 – the year of the Horse according to Chinese Zodiac. Horse is at the seventh position in the Chinese Zodiac. It corresponding to 1918, 1930, 1942, 1954, 1966, 1978, 1990, 2002, 2014, 2026… which the Zodiac is rotated to same Zodiac year every 12 years. Horses are symbol of great power, leadership and youth. 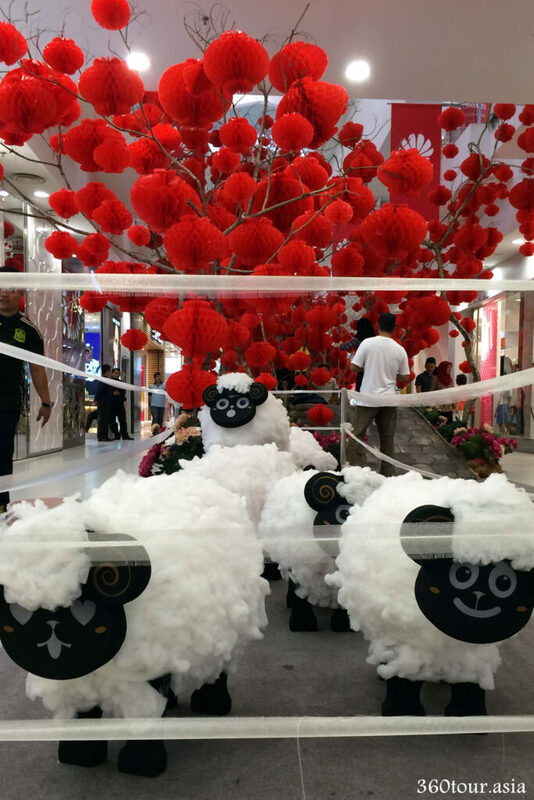 The herd of woolly white Sheeps in front of the Red Lantern tree at the court between Center and West Court of the Spring Mall during Chinese New Year 2015. The white trees decorating the court between Center and West Court of the Spring Mall in October 2016. Golden Horse PokeStop at The Spring Shopping Mall Kuching as shown in the map in Pokemon Go game. Occasional GPS accuracy can be significantly off in the Mall. “Golden Horse” PokéStop is depicted at the court section between Center and West Court of the Spring Shopping Mall, between Victoria Secret’s Store and Coach Store. However Pokemon Go trainers may end up finding its epicenter about 30 meters away at the area in between Pizza Hut / KFC and Ta Kiong Supermarket. Pokemon Go Trainers can access this PokéStop from part of the Ta Kiong Supermarket, part of Padini Concept Store, Coneli Sports, Pizza Hut and KFC Restaurant. Trainers can play Pokemon Go while Shopping in the nearest branded store outlet or have a relax dinning at the adjacent restaurant with friends and family. Do aware your surrounding while wander and catch Pokemons. This PokéStop have a possible Overlap with the nearby “The Spring Golden Coin” and “The Spring Water Feature” PokéStop. This is still one of the favorable PokéStop for Lure activation and farming. At times Pokemon Go Trainers Lure activate all the PokéStop nearby and create massive spawns frenzy. Inaccuracy of GPS signal might be an issue for some devices due to interference from the building itself. Occasionally Pokemon Go Trainers may have difficulty access this PokéStop even at the correct spot. This “The Spring Golden Coin” PokéStop is possible to be used for farming in this Mall as most PokéStop (5 of them) are within walking distance within the mall. There is one possible overlap with “The Spring Water Feature” PokéStop at the west court of the mall. GPS accuracy might be an issue with some device within the Mall. Pokemon Go Trainers can enjoy catching Pokemon while shopping, or have a relaxing food and beverages at the adjacent Nandos and Starbucks Coffee. “The Spring Golden Coin” depicts a series of huge ancient Chinese coins around the main entrance of the Mall. The huge coins replica is made from carved polystyrene foam, painted with a layer of gold colored paint. The Ancient Chinese Coins have a characteristic center square or round hole, for easy keeping of the coins as it can be bundle or tied together as a bunch with a ribbon. On the huge coin replica, there is wordings of greeting such as “招财进宝 (pinyin: zhāo cái jìn bǎo) means ushering in wealth and prosperity (idiom)”, “福星高照 (pinyin: fú xīng gāo zhào) means lucky star in the ascendant (idiom)”, “恭喜发财 (pinyin: gōng xǐ fā cái) means May you have a prosperous New Year”. The Golden Coins represent prosperity in the Chinese cultures. However these festive decoration are not permanent fixtures. The Golden Coins decoration is available during the lunar new year of 2014. The theme is based on the latest upcoming festive celebrations, such as Raya, Gawai, Chinese New year, Easter, Mid-Autumn festival, Deepavali, Halloween, Christmas etc. Malaysia is unique for its multi-racial, multi-cultural populations with freedom of celebration of own cultural festivals. The Christmas decoration of the Front Entrance of The Spring Shopping Mall during the Christmas celebration. Huge Toy Soldier is place along both side of the entrance welcoming you to the mall. A simple decoration of the main entrance during Hari Gawai (Harvest Festival for the natives of Sarawak), depicts two warrior shields. The Spring Golden Coin PokeStop at The Spring Shopping Mall Kuching as shown in the map in Pokemon Go game. 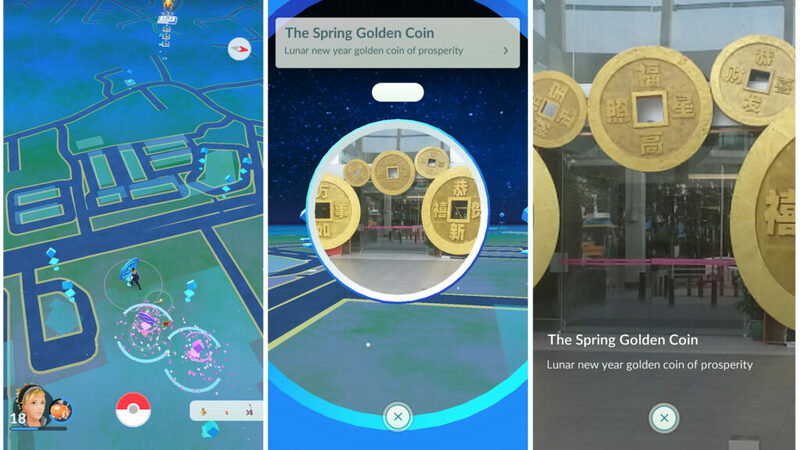 “The Spring Golden Coin” PokéStop is located near the Main Entrance of The Spring Shopping Mall. Pokemon Go Trainers will find the epicenter of the PokéStop is slightly outside of the mall Glass Atrium. The PokéStop can be access from the front open air premium car park of the mall, the Glass Atrium, and part of the retail shops on the west court including Nandos (previously Secret Recipe) and Starbucks Coffee. Pokemon Go Trainers can have a sip of relaxing coffee or having a tasty meal while catching Pokemon. The PokéStop is not accessible by the drivers of nearby busy traffic. Pokemon Go Trainers can wander and catch while enjoy indoor air conditioned shopping in the mall. However do aware of your surrounding when wandering, as you may end up bump into another shopper or run into decorative festive ornaments. The Spring Shopping Mall is one of the famous farming hot spots. However this “Heavenly Gong of Borneo” PokéStop not a favorable stop for farming as it is misplaced outside the Spring Shopping Mall, not withing the walking distance from other PokéStop within the Mall. Pokemon Go trainer who was at the adjacent Mosque instead can have a good overlap of access radius while within the Mosque compound. “Heavenly Gong of Borneo” depicts a pair of traditional Gong replica hanging on a bamboo stand. Gong is important musical instrument for the Dayaks. The actual Gong is usually made from brass, it is appear as a bossed or knobbed at the center of the percussion surface. The Decoration is placed during the Gawai Dayak celebration. Gawai Dayak is a annual festival on 1 June by the Dayak people of Sarawak (and also Borneo), and usually last a month till end of June. It is synonym to thanksgiving for a bountiful harvest for the year and mark towards a new farming seasons ahead. It is also known as rice harvesting festival by the general populations. Rice farming is the key life-sustaining activity among Dayaks. However these festive decoration are not permanent fixtures. 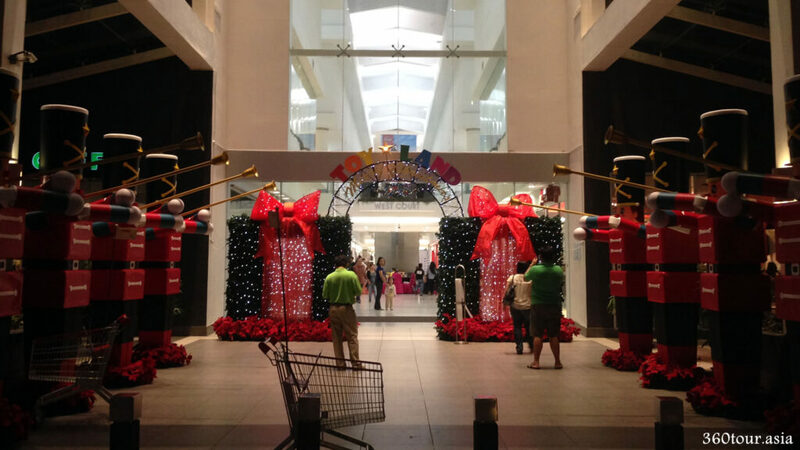 The theme placed on the entrance of the mall is based on the latest upcoming festive celebrations, such as Raya, Gawai, Chinese New year, Easter, Mid-Autumn festival, Deepavali, Halloween, Christmas etc. Malaysia is unique for its multi-racial, multi-cultural populations with freedom of celebration of own cultural festivals. Heavenly Gong of Borneo PokeStop at The Spring Shopping Mall Kuching as shown in the map in Pokemon Go game. “Heavenly Gong of Borneo” PokéStop is located near the Road Entrance to the Masjid Darul Ittihad (or known as Simpang Tiga Mosque) beside The Spring Shopping Mall. Pokemon Go Trainers will find the epicenter of the PokéStop is on the open area in front of the Mosque. 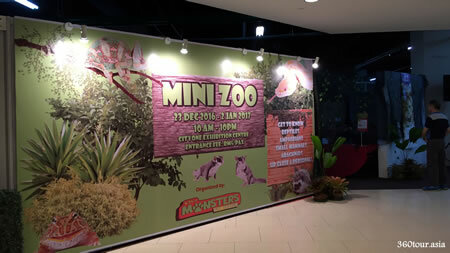 The actual attraction as depicted is at least 50 meters away at the main entrance of the mall. The PokéStop can be access from park of the front open air premium car park of the mall, however due to its location, Pokemon trainers may benefit more if access from the Mosque as there is clear overlapping with the “Masjid Darul Ittihad” PokéStop at the Mosque. The view from the carpark of The Spring Mall. The Heavenly Gong of Borneo PokeStop is nearby and may be accessible from the front premium car park of the Mall. The radius of the PokéStop covers the busy Avenue of Jalan Simpang Tiga. It is warned that Pokemon Trainers should not play Pokemon Go while driving, however passenger of passing vehicles along the avenue or pedestrian walking along the pedestrian path along the avenue might had a opportunity for quick recharge from this stop. The Spring Shopping Mall is one of the famous farming hot spots. However this “H&M Hanger Monument” PokéStop not a favorable stop for farming as it is misplaced outside the Spring Shopping Mall, at the Out door Car Park opposite Jalan Wan Abdul Rahman. It is not within close walking distance from other PokéStop within the Mall. “H&M Hanger Monument” depicts a huge replica of a red colored hanger partially embedded into the cement ground. The giant Red Hanger have H&M logo on it. This Hanger Storefront Monument is owned by the H&M fashion company. It was placed at the center of the front premium car park of The Spring Shopping Mall in conjunction of the launching of the first-in-Kuching and new H&M store on 30th October 2014. The store located at the Ground floor lot G27 of The Spring Mall. It will occupy a massive single floor shopping space approximately 33,000 sq ft, with all fashion clothing and sportwears ranging from latest, trendy till conservative. This storefront monument not only act as a publicity for the new outlet, but also is once an event in conjunction to the new store. During the initial launching in 2014, H&M will giving out special tote bag to the top 30 Instagram entries who stylishly pose in front of this giant red hanger in front of the Spring Mall. However currently this Hanger is no longer available, however the same spot was also use for festive decoration (such as Massive Christmas tree during Christmas Celebration), and open area for public showcase and promotion booth. H&M Hanger Monument PokeStop at The Spring Shopping Mall Kuching as shown in the map in Pokemon Go game. “H&M Hanger Monument” PokéStop is actually a misplaced attraction. The depicted location is at the center of the front premium car park of The Spring Shopping Mall, however Pokemon Go trainer will end up find the epicenter of this PokéStop is about 100meters away at the Spring Outdoor Car park which is just opposite the Jalan Wan Abdul Rahman. This Outdoor Car Park is once a reclaimed Resident Area, with sign of previous houses still clearly seen in part of the Car Park. The Spring Shopping Mall out door car park is where the H&M Hanger Monument PokeStop located. This PokéStop have coverage to most of the car park area, and part of the adjacent Jalan Wan Abdul Rahman. User of this car park can have a quick recharge from this PokéStop before taking a short walk to the Spring Mall. Walking down Jalan Wan Abdul Rahman and have a quick recharge from the H&M Hanger Monument PokeStop. Although this PokéStop is accessible from the adjacent road, but it is warned that Pokemon Trainers should not play Pokemon Go while driving. Wander and catch with caution as the road can be busy and the car park can be full. Always aware of your surrounding while playing Pokemon Go here as there is risk of hit by a running vehicle. Another option is to play Pokemon Go in the car with the comfy from the car’s air conditioner, only if you had parked your car in the parking lots. “H&M Hanger Monument” PokéStop is not one of the favorite stop for farming as it is far from the major farming loop of the Mall.